Bringing a group to Costa Rica? 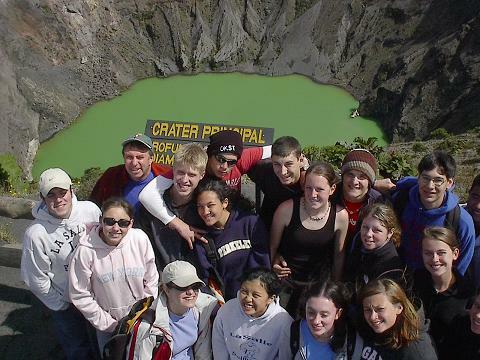 Our High School, university or groups of 10 or more, Spanish immersion. Service & adventure trips are from 7 days to 3 weeks and can be organized to fit any budget. Based on Spanish classes, community service work projects, local hikes and activities, our programs are known for attention to detail, friendships made and tearful goodbyes. A “Life changing” experience offering a better understanding of the world around us and our part in it with memories that will last forever. Student groups are small sizes with only group’s students in classes together. Most cases 3-4 students per group according to ability. Class content is focused on language activities that will help students communicate with their families and better understand the Costa Rican culture. We can help you organize dance classes, cooking classes, soccer nights, teaching English, Language exchange nights, arts and crafts night or Bingo night. Homestay families are invited for groups staying in families. Irazu volcano, Orosi valley, Tapanti National park, coffee tours, Orchid gardens, Bungee, Tarzan swing, Rafting and Canopy, hot spring pools, trout fishing, sugar mill and waterfall tours are available within the Valley and surrounding areas. Our service programs are usually physical work in repairs or simple building in local school or community buildings. We can also offer work in the social area usually teaching or assisting in schools or in educational type programs upon request. These are trips outside of the Orosi valley normally overnights in La Fortuna and Manuel Antonio where away fun adventures like rafting, canopy, river tours, hot springs and beaches can be experienced to be able to see a little more of Costa Rica during your stay. We are neither located nor based in the San Jose area – which means you have a chance to get away from the limiting city but not be stranded from civilization. Being located in a small safe town about 1 hour from San Jose allows students to really get out and get involved with the community on a daily basis, increasing their comprehension and understanding of the Spanish language and culture in return enjoying their program that much more. We own the Spanish School and hotel – we know our town, homestays and community and our staff are 100% involved in your program on a daily basis allowing us to set up the best program to fit your needs and goals with an unbeatable feel for that perfect balance that both participants and supervisors are looking for. We are the organizers and implementers of your program – no middle men here which helps save money. We can run programs through your home country agency or set up your program from start to finish. Immersion Programs from 1 to 3 weeks ranging from $600 to $1600 not including flight or insurance. The Sample Itineraries offered are the most popular and budget friendly. Have an addition… just let us know and we’ll see if we can add it on! Accommodations can be in Homestay families for those groups staying at least 5 nights and taking 4 Spanish Language lessons or more or in the hostel without limitation of Spanish classes or quantity of nights.